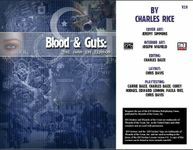 Welcome to the second edition of Blood and Guts: War on Terror, the campaign model that serves as the monster manual for the Blood and Guts line. In the real world the monsters are human and War on Terror updates these monsters to the second edition following the pattern used in Blood and Guts 2: Special Operations Command. These rules should provide the game master with the perfect opponents for his special operations campaigns, providing adventure hooks, historical information on the organizations involved as well as a number of ready made NPCs representing the rank and file of the different groups presented.